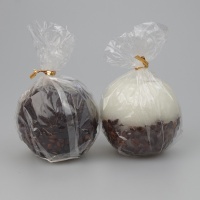 Luxury coffee scented pair of high quality ball candles with real coffee beans as a decoration. Luxury coffee scented high quality pillar candle with real coffee beans as a decoration. Luxury coffee scented high quality pyramid shaped candles with real coffee beans as a decoration. Luxury coffee scented high quality square candle with real coffee beans as a decoration.